New York City Mayor Bill de Blasio comments on New York Gov. Andrew Cuomo's State of the State address and executive budget proposal, Tuesday, Jan. 15, 2019, in Albany, N.Y. The massive snowstorm expected this weekend has forced the postponement of a talk by New York City Mayor Bill de Blasio in Eastport. Originally scheduled for 3 p.m. Saturday, de Blasio’s informal presentation titled “50 Years After MLK: The Path to Progressive Change Today” will be held at the Eastport Arts Center on Saturday, Feb. 9, at 3 p.m., said Lauren Koss, a spokeswoman for the center. The talk, de Blasio’s second at the center in two years, will serve as a fundraiser for the arts center. De Blasio’s aunt, Jean Wilhelm, lives in Eastport and has long been involved in Stage East community theater and the arts center. 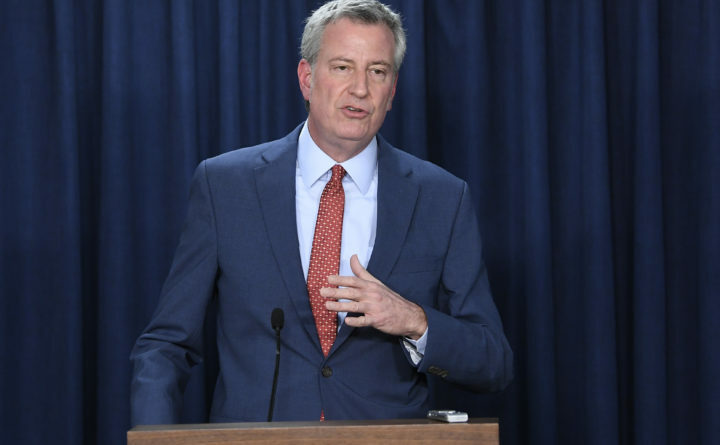 In remarks de Blasio gave last year at a New York press conference, just prior to his Eastport visit, the mayor said the purpose of his visit was to spend time with Wilhelm around her birthday. Anyone who requires a refund for Saturday’s event can contact the Eastport Arts Center at chris@eastportartscenter.org. For more information about the event, visit eastportartscenter.org.